This novel I happened to see on one of my friend’s Instagram and had immediate book envy! I absolutely love the cover and the novel itself sounded so intriguing! Let me just rave about this cover art for just a moment. The orange hues are incredible and if I was walking thru a bookstore and saw this book, I would instantly grab it. The cover art is elegant and appealing, especially to a reader who loves this era (like me). So, as it happened, I shamelessly begged for a copy of this book because I couldn’t stand the thought of missing out on it. I only have basic knowledge of Consuelo Vanderbilt and was eager to learn more about one of America’s icons. 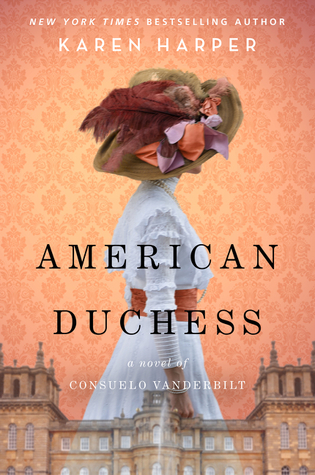 From the dawning of the opulent Gilded Age, to the battles of the Second World War, American Duchess is a riveting tale of one woman’s quest to attain independence—at any price (summary from Goodreads). Like many other readers, I think this book fit perfectly in with the most recent royal wedding of Meghan Markel and Prince Harry. I was primed to read something like this book not just because I loved the royal wedding, but I loved the idea of an American marry into British royalty. Plus the turn of the century is one of my favorite periods to read about so this was a book I was primed to love from the start. For me, this was a little more on the fluffy side of historical fiction. There was of course historical facts and references woven into the narrative but the bulk of the story focuses on Consuelo as a person rather than her historical impact which was perfectly fine with me. Because of this, her triumphs and struggles all felt a little more personal to me. I often found myself Googling little events and facts about Consuelo, she led a fascinating life and I couldn’t get enough of her the more that I read this book. I absolutely detested the Duke of Marlborough, or Sunny as many called him. I felt so bad for her and was astonished that she persevered in a less than ideal situation. I read this book much faster than I anticipated because I was completely taken in by the glitz and glamor of the heiress and the Duke. I couldn’t help but stay up reading late into the night. The first person narrative was very fitting for this book and made it enjoyable to read and was fast paced. Like some other reviewers, I wish I had known how many years separated some events in the overall timeline, but in general I loved this book and would highly recommend it to anyone who loves historical fiction and all things royal! Free review copy provided by publisher, William Morrow, in exchange for an honest review, all opinions are my own and in no way influenced.